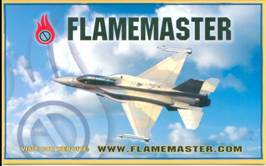 Pacoima, California, January 22, 2013 – Flamemaster Corporation (pink sheets “FAME.PK”) announced today that it has struck a deal to supply High Performance Polysulfide Based Aerospace Sealants into the Indian Aerospace Market. Some of the products the Company will provide include its proprietary CS 3204R to QPL AMS 8802. A brushable polysulfide quick repair fuel resistant sealant used on aircraft to yield weather tightness and fuel resistant seal. It is rapid curing. CS 3213 qualified to Mil-PRF 81733 containg Chromate, Synthetic Rubber Corrosion Inhibiting Sealant used in the sealing and coating of metal components on weapons and aircraft systems for protection against corrosion. CS 3204 qualified to AMS-S-8802 integral fuel tank sealant extrudable designed to withstand the attack of Sulfur compounds present in aviation fuels. Also used as pressurized cabin sealant and Fairing Compound. Shipments under this new agreement will commence in February 2013. Flamemaster is a Southern California based specialty chemical manufacturer of high performance sealants, adhesives and coatings servicing the Aerospace, Defense, Energy and Transportation industries.